We found a dry dock, have been there too in the meantime but it was no piece of cake. 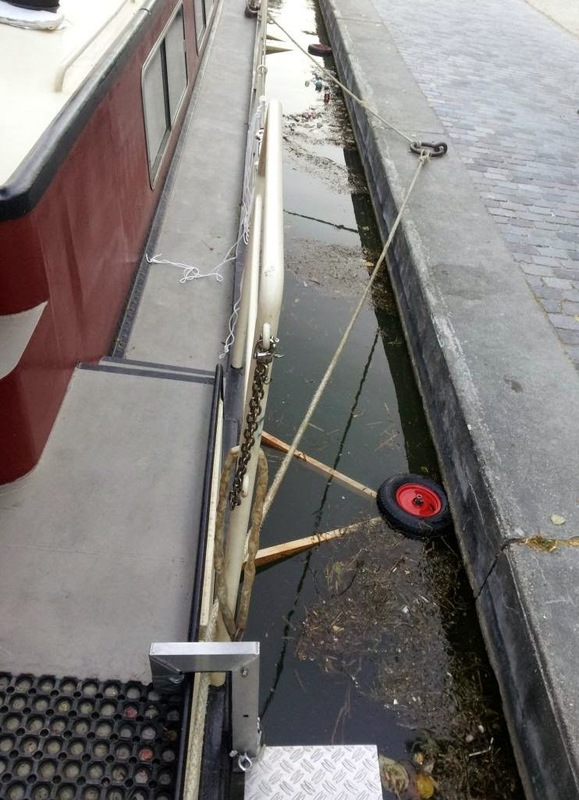 As we had already found out there are not many possibilities for repairs for our size barge in France. We tried to get information wherever we could and got a negative reply or none at all. Plus, August is a trying time to get anything done in France as many businesses are closed. Meanwhile we knew that we could be serviced in Antwerp on the 8th of September so we decided to amble along over there, trying our luck at yards as we passed, but to no avail. Michel picked up on cruising without the bow thruster and the crew also got better in mooring, managing locks and other manoeuvres; one gets used to everything although we had our moment. 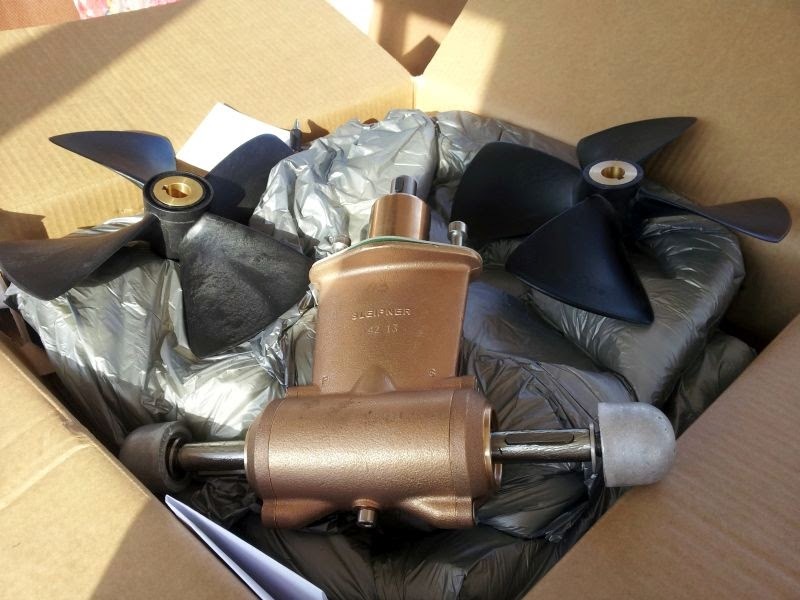 At least we now know why we wanted a bow thruster in the first place. Taking the by now familiar route through Reims we cruised to Berry-au-Bac. In the olden days a cross roads for the interior traffic with shops, chandlery, a bunker station and café’s. Now all these buildings are derelict and, pleasure boats apart, only the occasional peniche passes. It still is a nice spot to linger for a few days. From here we took the Canal latéral à l’Aisne and the canalized Aisne (in turn river and canal), a hitherto unknown waterway for us and very beautiful. Lots of locks, a few of them so called double-chambers: the lower chamber gets filled by the upper chamber and then in its turn empties into the river. Soissons treated us to a beautiful rainbow showing over some old houses on the harbour. And here we had visitors who came by car, enabling us to see more of the surrounding countryside like the Pierrefonds castle, a most impressive building. The oldest parts date from the 12th century, it was demolished in the 17th and completely restored in the 19th century, with pomp and luxury, by Napoleon. It is still intact these days and well worth a visit. And now for something completely different; a few days later we visited Guise, we went there on our scooter. So different but most impressive is this, partially dug up and dug out, medieval castle. Volunteers are working there for over 60 years already, also guiding you through endless tunnels, corridors, caverns and halls, informing you that only 25% has been restored. The only remaining building that was built above-ground, the tower with a kitchen high up and a still visible chimney. Both castles well worth a second visit, but then taking our grandson :-). After Soissons was the first time in weeks that we had no visitors and we could apply ourselves to (overdue) household tasks, filling in our tax forms (a bit overdue as well) and repairing mooring lines. Leaving Choissy-au-Bac we cycled to the Armistice Clearing, a most fascinating spot well within the woods where they signed the truce between Germany and the Allied forces on November 18th, 1918; a defeat for the Germans marking the end of the first World War. But also the truce between Germany and France of July 22nd 1940, a big victory for the Germans, was signed at this very spot. In 1918 a railway dining carriage was shunted to this open spot where the declaration would be signed. Later the wagon was brought to a Paris museum, but in 1940 Hitler ordered the carriage to be returned to the very same spot, restoring the very same interior. By paying attention to all the little details, like the setting of the table and sticking to the same times of arrival and departure, Hitler reversed the roles, thus emphasizing Germany’s victory. Afterwards he ordered the spot to be demolished, except for the statue of Marshall Foch, erected in 1918, who now looked out over empty space. The wagon was brought to Germany as a trophy and destroyed in 1945, so the present carriage is a replica. This is where history is made palpable. 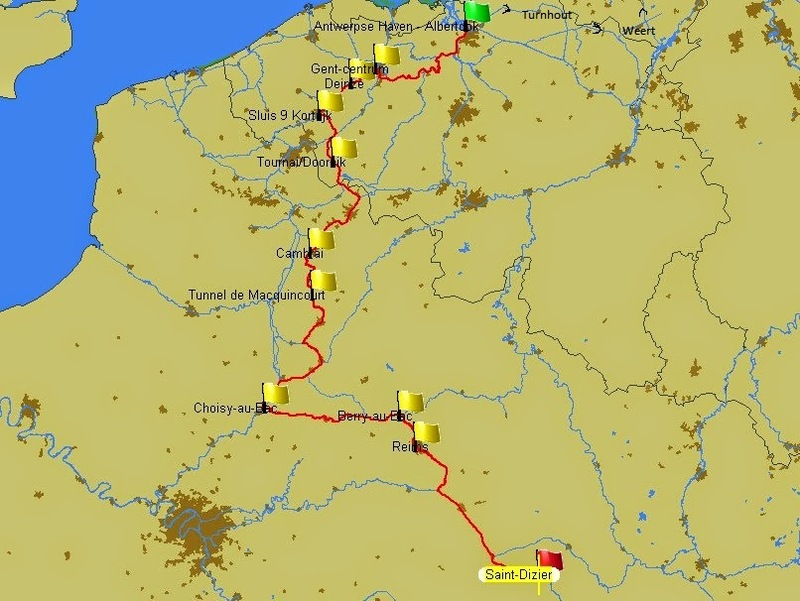 As we had plenty of time we decided to take the Canal Saint Quentin back north instead of the Canal du Nord. Last year we went through the tunnel in this canal without a hitch. Although it is the longest tunnel (5.3 K) in France and the only one where you’re being pulled through by means of an electrical tug, we foresaw no problems. 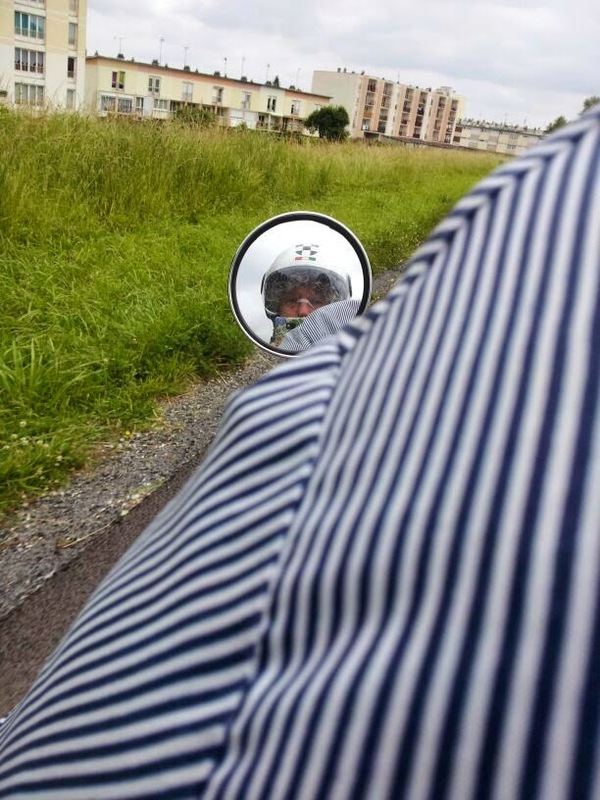 The Saint Quentin canal is nice to cruise, but then … that tunnel. Alas, things turned out differently. Last year the brought out one line, that split in front of our bow, so we stayed central behind the tug. For reasons unclear they now brought out a single rope, brand new and very stiff, and things went wrong. We followed all instructions to a tee and three times in a row our ship was pulled into the tunnels side. Without a bow thruster there was no way to correct and we felt powerless; only by shouting and hooting we could make them stop the tug. The tug’s crew got angrier and angrier and started shouting commands in French which we didn’t understand which made them shout even louder. Meanwhile our railing was a bit bent and quite a bit of paint was scraped so we were not too happy either. So it happened that the tug’s crew made us loosen the rope and told us to cruise the remainder of the trip on our own. We happily did so, covering the remaining 5 K without a hitch. Afterwards the damage was inspected and reported to a VNF official who told us that this was already the second time that week and two other ships reported the same problems. It’s a pity but it’s just paint! We will take this tunnel again next time, but only when the bow thruster is in mint condition. Before we crossed the border to Belgium we paid Cambrai a visit. What we didn’t know was that there was a fair, covering all of the centre, we’ve never seen anything like it. Not one haunted house, but three; not one shooting gallery but ten at least and so on. 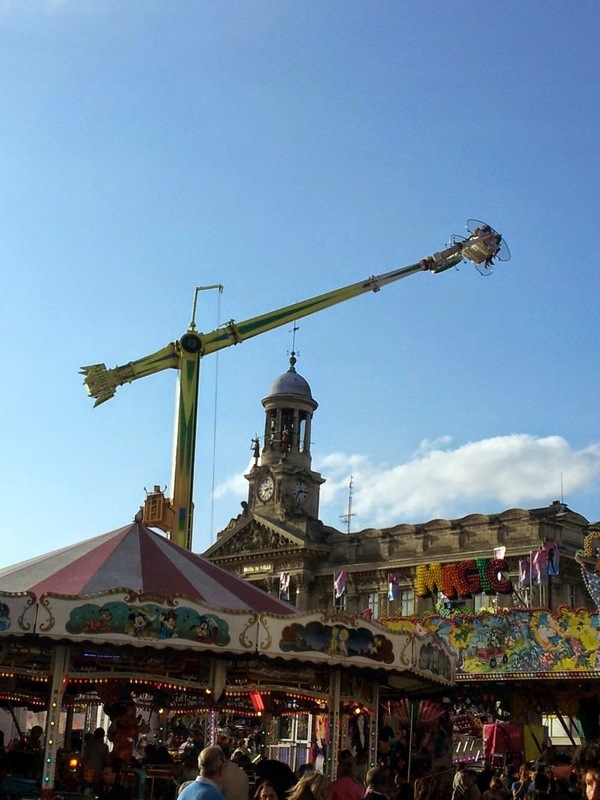 I get a bit sick already by thinking about a Ferris wheel, but looking at a wheel where people were swung high over the town halls tower, yack! Further north we had arranged a meeting in Tournai with friends, who were on their own barge. 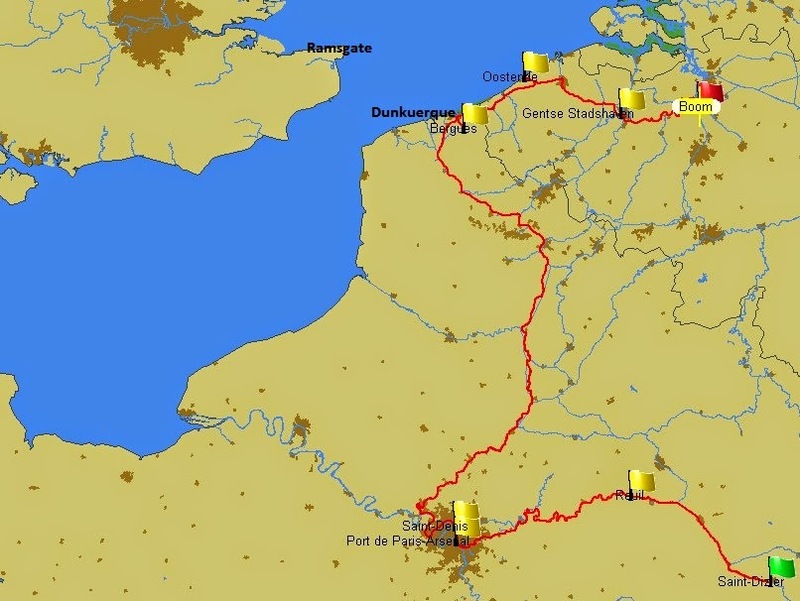 We cruised together for a few days, doing the Bossuit Canal and the Lys river until we reached Deinze. Michel and I made a slight detour to Oudenaarde and back, because we hadn’t been there before. The only thing we did there was take a nice photo of our ship in front of the church and that was all because it was raining plentiful. Still on the list! 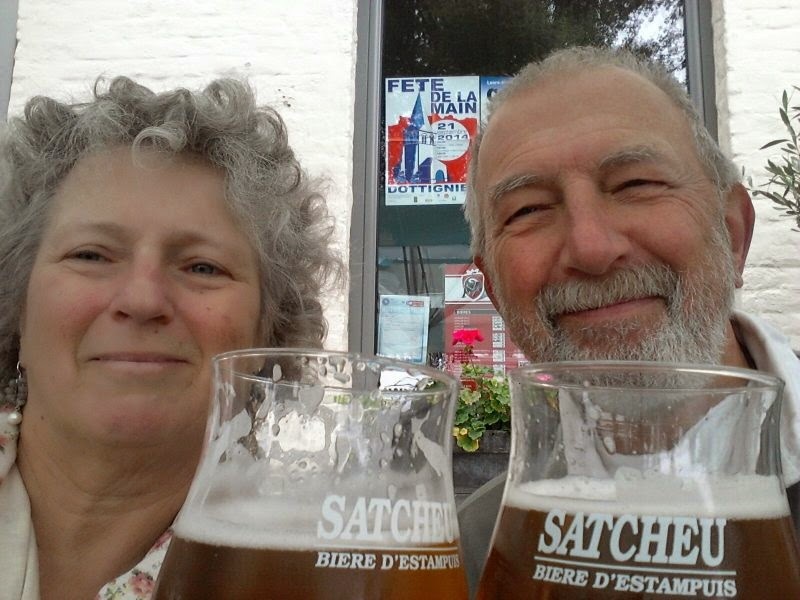 In Belgium you can have your fill with nice beer and after a cycling tour it is very rewarding. The only reason for putting this picture in the blog is that I think it is a nice picture. Cheers to the readers of this blog! So far, so good and then via Ghent and the Scheldt river, tidal and no bow thruster, to the ship yard of the Moordtgat family. First we had to back out and park in between the giant ships that were all over the place so we could get into dry dock. Beware, where our neighbours could only get their bow or stern in, we fitted completely. The skippers have time off, there’s other people working on their barge, so they have plenty of time to watch us and make comments (all nice and positive). As we were completely out of the water we wanted an inspection of our propeller, as we still felt something was not right after we had a steel cable wrapped around the prop last year (see the September 2013 blog). 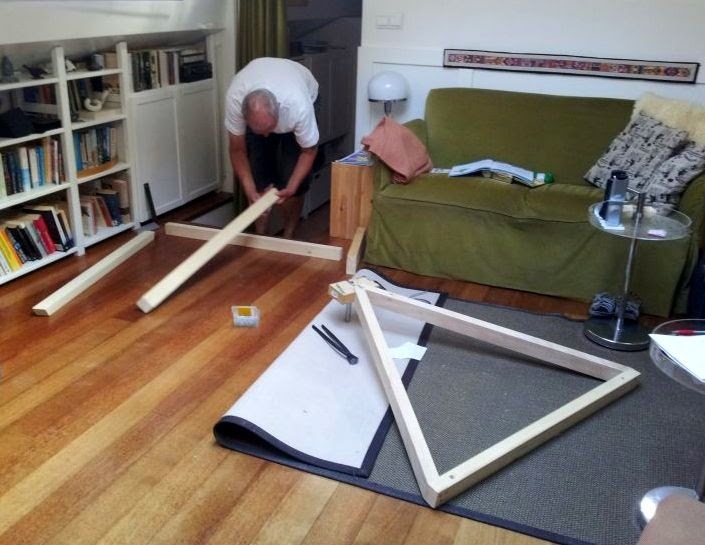 It turned out to be wise and, advised by our caring and helpful insurer, the prop was taken care off. All in a day’s work for those chaps and refitted the same day. At the end of the day the propeller is mounted again, smoother and shinier than we’ve ever seen it. What we really came for was the bow thruster. Once out of the water we could clearly see a lot of rubbish in and around the props and we could also see that the bars prevented access. You can get your hand in between but then you cannot get a good grip on something so tightly wound, as the diver in the Bassin de la Villette had found out. At first we had no bars at the tunnels openings so quite often branches and rubbish went in and damaged the props, most of the time getting out on the other side, but not good. Now we have bars, less branches and plastic bags get in, but when something gets stuck you can’t get at it. We’re considering mesh, that should be easy to remove, but we are still pondering. After half an hours serious pulling and pushing everything had been removed; it turned out to be part of a big bag with tie ribs and all and quite a lot of it. We did a dry run with the bow thruster that produced a bit of a rattling sound but the mechanic said it was all right and as it should be. Back went the bars, then the stern prop was refitted and we went back into the water. Hurray, we’re going in again and can be off. What a pity, it didn’t work that way. Once in the water the bow thruster did not function, when doing the dry run with no pressure it seemed OK, but now there was no jet. So, off to the quay again, everybody went home and we had to wait till next day. From the inside we could diagnose that a big part of the thruster, the gears, had to be replaced, but only after demounting the thruster. And that required to be lifted again. So we had to consult our insurer (VNN was very helpful again), a surveyor had to visit us, we had to arrange things with the dealer in Amsterdam and then we had to wait for the delivery of the package. By Friday we went out again, bars had to be cut away, tailpiece to be replaced, bars welded back and when the paint was dry we were off. Everything functions as expected, no strange sounds or curious vibrations. 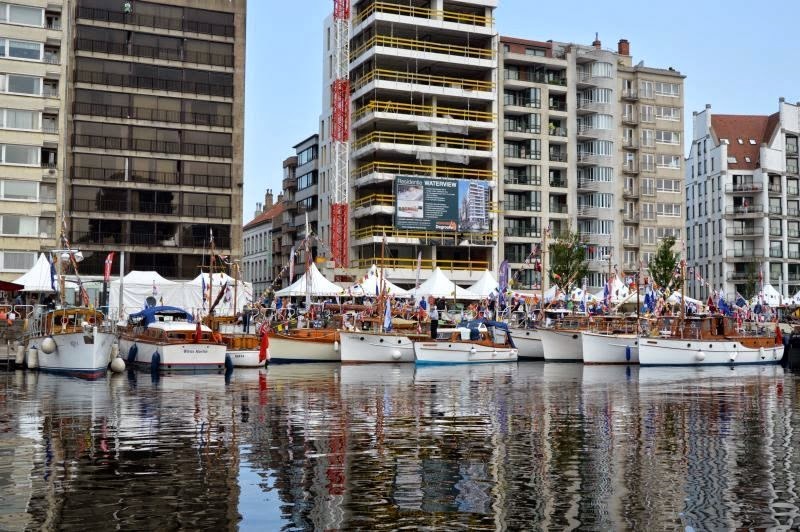 Although everybody had been kind and helpful and there was not a lot that we could do ourselves the days were tiring, if only because the Antwerp harbour is a round the clock operation and you notice that all around you. 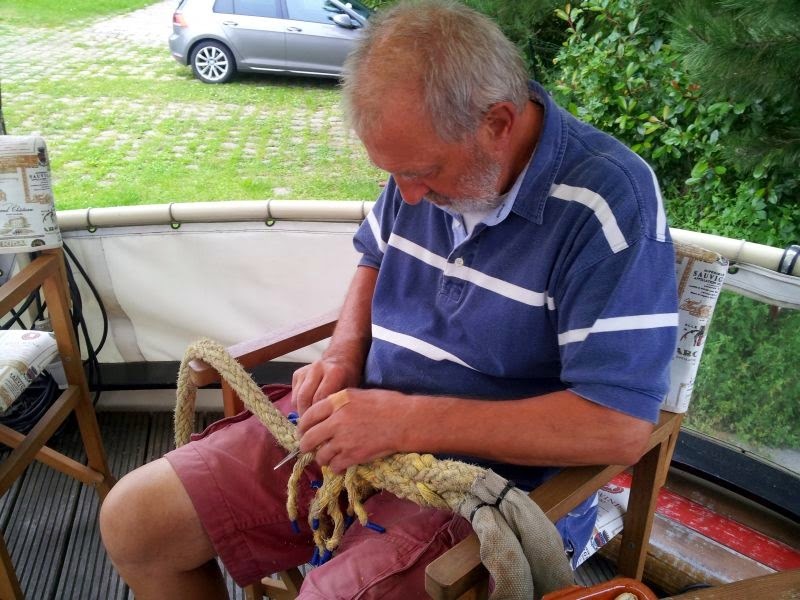 After an hours trip we entered the canal from Schoten to Dessel and we moored at the first green and quiet spot, getting our feet under the table again. This year’s last leg and blog will be from here to Amersfoort, more about that later.